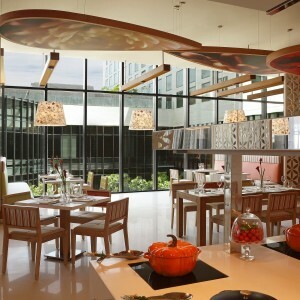 Located 200 m away from the Delhi aerocity metro station – Pullman New Delhi Aerocity offers 6 restaurants and bars, a full service spa and salon, and an outdoor swimming pool. Free WiFi is available throughout the property. Worldmark that consists of premium offices, shopping outlet and eateries is 200 m from the property. Being located at a 15-minute drive from Cyber city, the complex hotel with 670 Rooms (including Novotel New Delhi Aerocity) makes it an ideal location for all travellers. The air-conditioned rooms feature Bose sound link II, flat-screen satellite TV and Espresso Coffee Machines. It also has a minibar and tea/coffee maker. The private four-fixture bathroom comes with shower. Dining options include Pluck, a modern day eatery with an in-house farm. It has a unique Tea Deli concept that showcases a selection of Indian and International teas. Honk serves Pan Asian delicacies while Pling is a lounge bar. Refreshing beverages can be enjoyed at the all-day Café Pluck. Food Exchange is a multi-cuisine restaurant and Quoin, a modern bar that offers exquisite wines and cocktails. 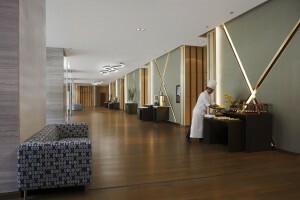 Pullman New Delhi Aerocity has a well-equipped, large and pillarless meeting/banqueting space. A variety of Ayurvedic, Thai and Swedish spa treatments can be enjoyed at the Woo Wellness Spa & salon. A fully-equipped health club – Fit Lounge is available. Shopping Malls in Delhi like DLF Promenade, Emporio and Ambience are located within 5 km. Rashtrapati Bhavan is 10 km from Pullman New Delhi Aerocity, while Jantar Mantar is 12 km from the property. Pool Timing for Summer are 6:00 a.m. to 10:00 p.m. Pool Bar is operational from 11:00 a.m. to 08:00 p.m.